Local amenities are a short walk from the home and include shops, cafes, pubs, a library and doctor’s surgery. We are located on a quiet side road, a mere stone’s throw from the cricket pitch, bowling green and beautiful weir. A nearby hotel and restaurant are also located on the river Thames. Here at Cleeve Lodge we have our own cook who prepares home cooked and tasty meals daily. There is a varied menu on offer with recipes designed to meet all dietary requirements. We take pride in sourcing our fresh produce from local suppliers. Meal times themselves are sociable and stimulating times. Our dining room is bathed in light, creating a bright and positive ambience. Residents and staff eat side-by-side, extending that family feel. Food is typically served in the dining room itself however we can arrange for meals to be brought to a room, should your relative prefer. Breakfast – Fruit juice, cereal, porridge, toast with marmalade, eggs, fresh fruit. Tea or coffee. Lunch – Roast pork, roast potatoes, seasonal vegetables, apple sauce and gravy, or chicken in white wine sauce, creamy mash and honey glazed carrots OR salad with ham, chicken or boiled egg. Dessert – homemade bread and butter pudding, fruit crumble, rice pudding or ice cream. Supper – Homemade soup or sausage rolls, selection of sandwiches, cheese on toast. Fresh fruit salad, yoghurt, fruit mousse or small cake selection. Coffee and tea is served in the dining room and lounge after meals. Alcohol is freely available, either with a meal or during the day. Extra snacks and drinks are available upon request throughout the day and night. "The chef was knowledgeable about each person’s needs and told us ‘I have a list of people’s likes and dislikes. People were positive about the food. One person told us ‘we have good food and when my family visit we eat together’. Relatives were complimentary about the food. Comments included ; (Person) gets very good, freshly cooked food, just like a five star hotel. The staff sit and talk to her, they take their time and encourage her." "Cleeve Lodge has been awarded the highest rating for Food Hygiene of * * * * * Five Stars." 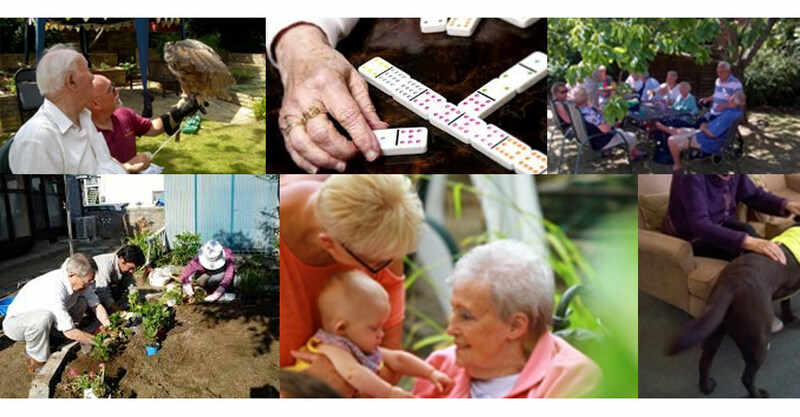 We encourage social interaction and try to provide our residents with a varied entertainment programme. We understand that all of our residents led busy lives before Cleeve Lodge; with jobs, families, friends, hobbies and interests. As a result, we try to incorporate each all within our own activity schedule. A typical week of activities would include music, exercise, crosswords, group discussions, reminiscence and a visiting poet. Elsewhere two popular entertainers regularly frequent the home, providing welcomed familiarity. We also have a monthly visit from therapy dogs. Daily newspapers, magazines, fresh fruit and sweets meanwhile are available throughout the home daily. Most days, staff will walk with residents into the village to go to the shops, watch the cricket or have a coffee. We attend a coffee club in the village most Thursdays and a cinema club once a month. Our Activity Coordinator creates a suitable activity plan which is person centred and enhances our resident’s daily living. All resident birthdays are also remembered and celebrated. Our activity programme is displayed in the main hallway, along with photographs of our residents. Holy Communion is held once a month. Other denominations will visit residents upon request. "People were supported by staff who were totally committed to delivering meaningful activities to people to reduce the risk of social isolation. People were able to spend their time as they wished. One person told us ‘There’s lots to do. We get taken out when we want, I went to the river last week. We listen to records, watch the television, do puzzles and go into the garden." "The service was outstanding in responding to people’s needs and preferences. The provider, registered manager and staff took exceptional steps to ensure people received personalised care that valued them as individuals. The extremely inclusive culture in the service meant people were actively involved in all decisions about the service and their views and opinions were respected and acted upon." "People’s pasts were valued by staff and used to provide personalised support. People who chose to remain in their rooms or were unwell were visited regularly by staff. The provider used a dependency assessment tool of people’s needs which was reviewed monthly."